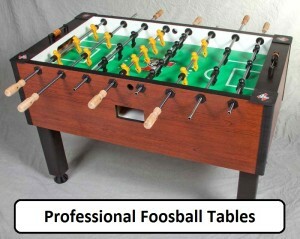 Professional Foosball Tables - Find Ones Which Are Top Quality! Today we are going to help you find a professional foosball table. There are many models and brands which produce foosball tables, but not all of them are the same quality. Some of them are better than others and these are one of the professional foosball tables. These are made of top quality materials to provide excellent play. 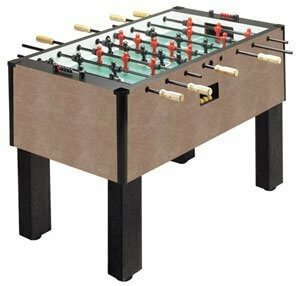 We will mention different professional foosball table brands and some of their models on which we also made reviews. Let’s start with one great model. The Warrior Professional Foosball Table is in a class by itself. Manufactured in China and assembled in the United States of America, this foosball table has become the most sought-after table for tournaments and home play. It is the table used in the Warrior Professional Foosball Tournament, the ITSF or the International Table Soccer Federation and the USTSF or the United States Table Soccer Federation has both recognized this foosball table for professional play internationally. This foosball table has used the most high-end available technology and state of the art materials to make this one of the professional foosball tables. 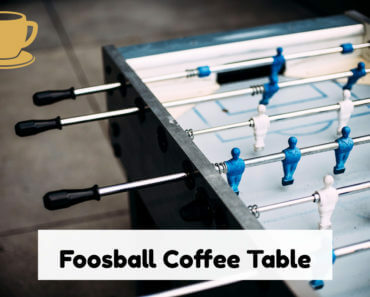 Components are sourced and combined to realize this quality standard table, which is sought after worldwide for all professional foosball players. Foosball Playing men are made with state of the art ABS plastic or Acrylonitrile-Butadiene-Styrene; which is a hard plastic, pliable enough for molding. These players are made with wide feet to enhance better ball control. The men come in two colors; Black and Red. Foosball Handles are made from hard plastic. These handles are so designed to prevent wear and tear during long hours of play. On the Warrior Foosball table, these handles are color coordinated to match the teams of players on either side of the field. Warrior Foosball Table Rods are made from solid steel which when played, as described, feels as though playing on ice! The foosball balls are made from a special hard plastic called polyurethane. This plastic enhances grip and control during play in foosball. Cabinet of this table is made from durable MDF or Medium Density Fiberboard. This compound is hard enough to withstand the roughest play during playing Foosball and so is considered the best material there is to make the cabinet. The combination of all these components on the Warrior Professional Foosball Table makes it a hefty weight of about 200 pounds. With this much heft, it feels as though you are playing on about 400 pounds of a surface; while it is easy to move whether at home or a tournament. This feature is guaranteed by the Warrior Foosball Table manufacturers. Looking for a top quality table on sale? 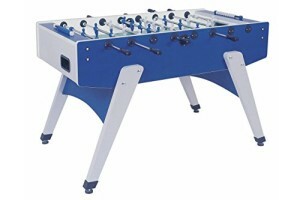 These Foosball Tables are just some of the many professional foosball tables that are available. The price ranges are comparable and you are sure to find one to meet your needs. 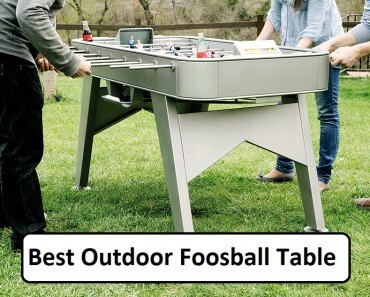 The above-mentioned Foosball Tables are rated amongst the best. We spoke about the Warrior table earlier; now we will include some specifications on the other tables listed. 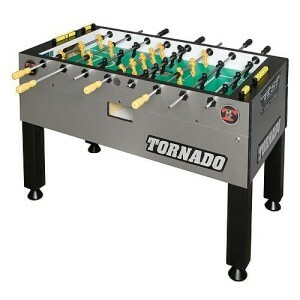 The Tornado Classic Foosball Table is made of a 1 1/2inch thick Laminate cabinet. The commercial leg levelers are definitely an asset if the table is positioned on a not so level surface. Solid wood handles for comfortable and easy grip, is also essential for confident and rigorous play. This foosball table weighs a whopping 225 pounds and with heft is sturdy enough to not move during energetic playing by family and friends. 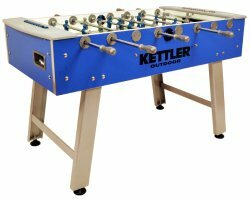 The Kettler Cavalier 58inch Outdoor Foosball Table is definitely a foosball table built for outdoor use; made in Italy, this table is class. The cabinet is made from high-grade weatherproof resin and laminate. The playfield is made of glass for smooth swift play and also to weather the elements. The anti-rust chromium plated rods are also an incentive for owning this table, as it is made to withstand rough play and durable for outside elements. The players are molded to the rods, so there is no chance of them ever coming off during play. Creativity and well-engineered nylon bushings are a part of the works that reduces wear and tear and enhances speed during the playing of foosball. There is the added weight of this foosball table of 137 pounds, that is guaranteed remain stable during play; and the leg levelers are also an added feature for sure stability. Choosing to own an Imperial Butcher Block 55inch Foosball Table is an investment in class and culture. This table is made of quality butcher block design with an MDF playfield. The double chromed rods with solid rubber handles affixed are sure to give you confidence during playing, as they are made to withstand playing even with sweaty palms. Solid butcher block square legs that are sturdy enough and covered with rubber grips, to not shift during energetic play, on any surface. Estimated assembling time is about two hours; which is not such a bad time when you experience the incredible play on finishing. 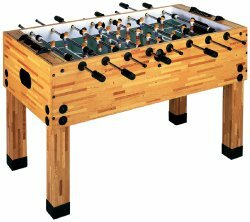 The cost may not look as though you are getting a good buy, but on owning an Imperial Butcher Block 55 inches Foosball Table you will be pleasingly surprised at the quality. Professional Foosball tables are readily had on Amazon. The reality is, knowing what you want are willing to pay the price for the item; will give you many years of pleasure. 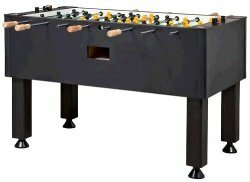 A professional Foosball table, whether it is a Warrior Foosball table or an Imperial Butcher Block 55 inches Foosball Table has the manufacturers’ guarantee of quality. The fact that both professional and amateur players have signed off on the quality and experiences they have had during playing on any of the above foosball tables is enough of an incentive to want to, and owning one. 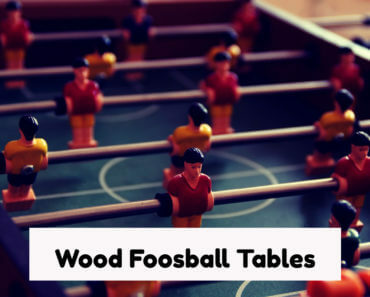 You will not be disappointed, as you, your family and friends will have many hours of fun and playful challenges while playing on the foosball table of choice. Maybe you now don’t know what to do? Well, you have now read about professional foosball tables and how should a good table look, so now is the time you take action. 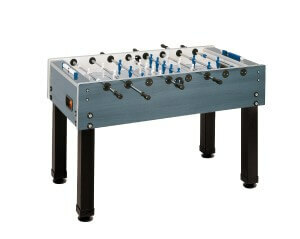 Find your best foosball table model and order one or more for you. 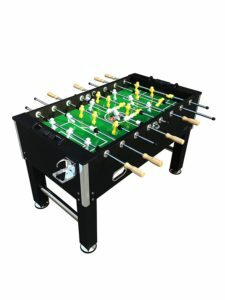 If you are still not sure about which models to choose to take a look at youfoosball.com reviews to find more.